Peau Pinstripe 22", Drum Head from Remo in the Pinstripe series. 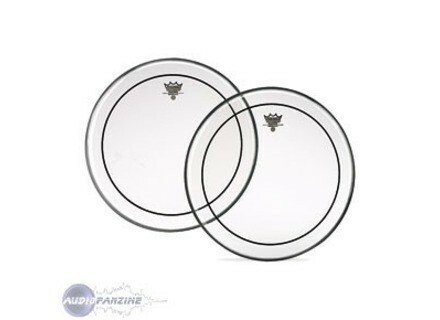 Oh, the Remo Clear Pinstripes, these skins were on the very beginning, when I first grabbed a pair of drumsticks. Consequently, they became a permanent part of my kit for the first 7 years of my drum career. Look for the value pack, around $40 for three tom heads. Otherwise, they cost around $15 each. Besides of not currently play with them, I still love the pinstripe tonal qualities. They make my toms produce a huge, in your face sound, with a not too bright attack and a big body. I think these are also very versatile, giving you a big range for tuning. Because of its thick construction plus its overtone control ring, even when tuned low these skins will still sound musical and specially powerful. There are no better skins for metal drummers than the pinstripes , at least thats my opinion. They are also sound great not only live but also in the studio. 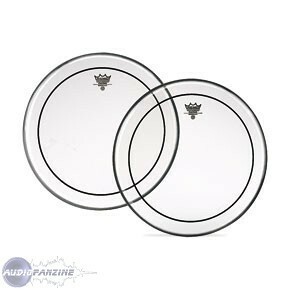 They are great skins to learn drum tuning, perfect for those beginning to drum. The Clear Pinstripe heads are made of two 7-mil Mylar film. Very durable skins. Giving a big and powerful tom presence, the Remo Clear Pinstripe has a moderate attack and a wide tuning range. I've been playing drums for about six years, mostly metal. I play a lot of fear factory, as blood runs black, etc (you know, the fast stuff). I also play some techno and some jazz. I bought these online from massmusic.net (great website, by the way). I paid about $45 for 4 heads, sizes 10, 12, 14, 16. They are very easy to tune and are durable. It was very easy to get a good metal sound, the attack really stands out. Pinstripes are the only head I've ever played where you will always get a good sound, but never get a great sound. They are just very average. I own a top of the line kit, so overtones have never been an issue for me, but I think the pinstriping would do well to remove harsh overtones on a lower quality set. They are constructed pretty well. The film it self is very durable, and the hoop is average. I think remo uses a better glue than evans, but not as good as aquarian. If you want amazing drum sounds, don't buy this head. But if you practice on the weekends and own a lower-priced kit, try them out. They take off any bad overtones, last forever, and always sound decent. Its main quality is an attack really fat, and frank. Ideal for rock or metal. His dfault is a certain lack of versatility. RMO is a trademark of an excellent quality price, the best in my opinion. I love this skin but I have not tried the 3 powerstrock that looks really good too. I'd surely the exprience later, but for now the Pinstripe is the best for me. Other names: peau pinstripe 22", peaupinstripe22", peaupinstripe 22", peau pinstripe22"